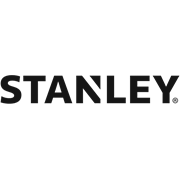 The STANLEY Essential Rolling Chest with wheels and telescopic handle is a perfect mobile storage solution, constructed from sturdy plastic for added durability. 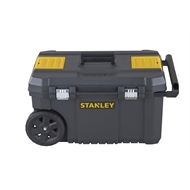 The geometric heavy duty metal latches enables smooth opening and closing of the lid. The long telescopic handle and large 7’’ coated wheels make this box easy to manoeuvre during transportation. An Innovative V-groove has been detailed into the lid, which can be used as a platform for cutting timber and pipework. The large 50L storage capacity of the box is ideal for storing large to medium sized power tools, a portable tote tray provides additional flexibility to your storing needs. The top organisers allow for small parts storage such as screws, wall plug, bolts and nuts.